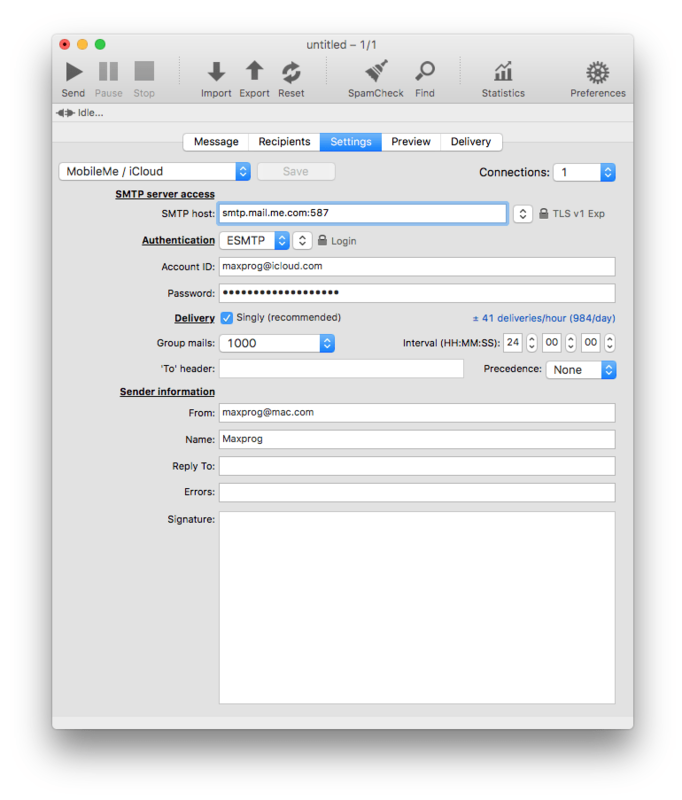 SMTP Host smtp.mail.me.com:587 or 25 or 2525. The latter is the only one that doesn't prompt an immediate authentication error message. 2525 doesn't do that but nothing happens - negative or positive. Answer: The settings for using MaxBulk Mailer with Apple iCloud server are available here: MaxBulk settings for Apple iCloud. Indeed a custom app specific password is required for MobileMe/iCloud accounts. If your password is not accepted just turn off the two-factor authentication option here or better create a password for MaxBulk Mailer from the same page by clicking on 'Generate Password' (in Security, below APP-SPECIFIC PASSWORDS). A pop-up box will open, just enter MaxBulk Mailer (or any name you choose). Apple will then generate a secure password. Copy this password into the Settings > Password box in MaxBulk Mailer.